Learn how to lay veneers, make & fit stringlines, inlay and marquetry. Veneering materials and projects are included in the course price. If you have veneered items that you would like to restore then book onto a Furniture Restoration Course. 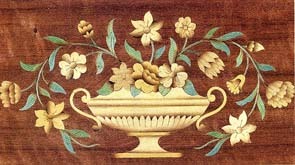 Make a marquetry panel to a supplied design, or if you prefer to your own design. An informative & enjoyable week at times quite amusing. Excellent, enjoyed the design aspects and seeing it all come together. As usual the notes supplied were excellent. Thoroughly enjoyed the course. Very informative. I would definitely do another course. Thank You. Great fun with intensive work (and still some to do! ) Will definitely finish what I started and continue with more. Personally, I liked the low numbers. Thanks very much for your tuition, hospitality and friendliness.